This is the text of Professor Robert Feenstra's 'Global Economy Lecture' which he delivered in February 2007. It is part of a lecture series organized jointly by the Vienna Institute for International Economic Studies (wiiw) and the Austrian National Bank (OeNB). 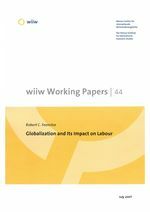 In this lecture, Professor Feenstra covers a wide range of issues related to the ongoing discussion of the impact of global economic integration upon labour markets: the impact of outsourcing upon wage structures and upon productivity, the effects of NAFTA upon the US, Mexican and Canadian economies, the issue of outsourcing in services, the impact of international migration flows, etc.